Mommy! The commission is being mean to me! It won't do what I tell it...wauuugh! Sometimes you're magic, sometimes you're not. Right now I'm in a mojo free zone. I'm a hack, I've always been a hack, I'll always be a hack... I'm takin' a break. I'm not going to risk drawing anything, I gots no mojo to spare and if it comes back I need it for the commission. Let's try a variation of the grab bag and go to the Big Box-O-Xerox where we find copies of the art for X-men 168. The first two X-issues I did I was hangin' on by the skin of my teeth and had little time for thought as to what I was trying to do. When I brought in the first batch of pages of 165 (my first issue) the silence was deafening but, the message was clear, "Boy, did we pick the wrong guy for the job!" EEK! I return to my lonely artist's garret, put nose to grindstone and, by the time Storm morphs into one of the Brood, manage to bring the X-Office around. Then they tell me 166 is double sized... double EEK! No time for thinking, just go home and draw. It's not till 167 that I have a chance to breathe. 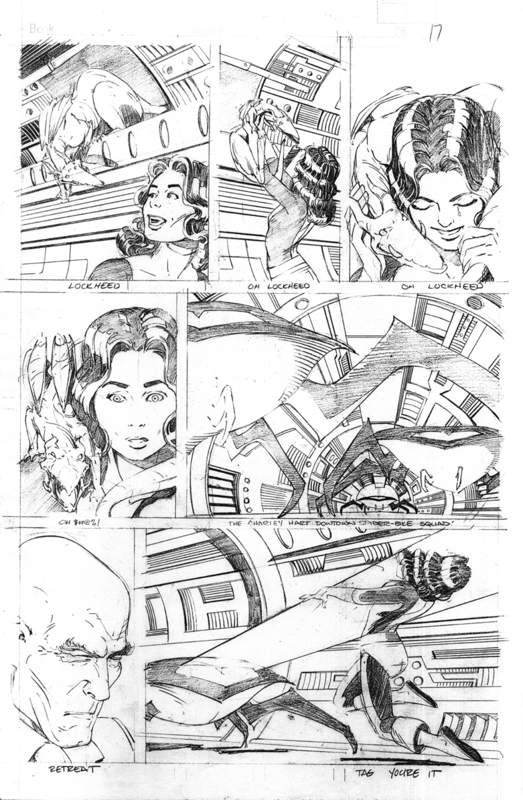 I'm visiting with inker Bob Wiacek when he asks what I'm looking for, can he change anything. He wants me to be happy with how the book looks. That's when it hits me. This is our book now. Defining the look is not just OUR job... it's our JOB! It occurs to me that fandom could have the same initial reaction the X-office did and desert the book in droves. So far, everyone wants to compare the book to something they've seen before... all righty then, I got your comparison right here. Bob and I decide to strip the art down to the bone. Bob and I go for a hell bent for leather, breakneck speed counterpoint to the writing. A, "Move along, nothing more to see here, folks" approach. To this day, this seems to be what people think of as the Paul Smith style and, it's not. It was a team effort. Any other inker and it goes in a completely different direction if it goes anywhere at all. If you like what happened visually during our run, it's Bob's fault. If you don't, blame me for not giving him enough to work with. The new look starts to develop during 167 but it's 168, down in the tunnels, where it really takes hold. Plus, Lockheed shows up at the mansion where he and Kitty do their rendition of Peaches and Herb's "Reunited (and it feels so good)"
I've stalled long enough... back to the Pit of Despair in the Land of No Magic. Have at thee, commission! Have at thee, I say. Years ago. I'm at a show. I gots no magic. Like Dicken's Oliver, I approach Adam with empty outstretched hand, "I got's no magic, ya' gotta' save me." Without hesitation, Adam drops his pencil and skritches my open hand. Skritch, skritch, skritch, skritch, skritch,. "There ya' go!" I return to my table and magic flows from my hand like the waters of the mighty Mississip. Sometimes ya' got it, sometimes ya' don't. Sometimes, Adam Hughes is there to save you, sometimes, ya' just gotta' wait it out. I'm better now. Thanx fer the concern. Maybe don't stress the commission so much and loosen up with something just for fun. Draw something like a goofy character with the worst costume ever -DC's Killer Moth or Marvel's Turner D. Century are my choices for that. Or maybe just look at your own artistic heroes for inspiration on layout. The classic "Z" or figure 8 are favorites if mine- stuff that keeps your eye moving. Your mojo will return when it gets hungry....though that might be cats. Same thing, really. So, I should eat a cat? I don't see my neighbor's car in the driveway. Oh, Frieda... here kitty, kitty, kitty.